*Disclaimer: This recipe is not recommended for babies under one year old because of potential botulism (i.e., food poisoning caused by a bacterium (botulinum) growing on contaminated improperly, sterilized/canned foods). However, with that said, botulism is extremely rare, as there were only 174 U.S. cases in 2015. I have given my kids local raw organic honey before they were a year old due to cough/cold. This is not meant to diagnose, treat, cure, or prevent any disease and does not replace medical attention. Optional: 1/2 tablespoon organic turmeric powder and/or cinnamon powder (or one cinnamon stick). If I have these, I always add them in. Option 1: Some people very simply add all of the aforementioned ingredients into a jar and let it sit on the counter for at least 8 hours to let the ingredients infuse. After the 8 hours, add in the lemon juice, strain, and store in a glass jar. You can leave it on the counter for at least a week or for longer-term storage, keep in the fridge for a month. Stir before use. Take room temperature or warm. You can take it by the spoonful or add to tea (green, peppermint). 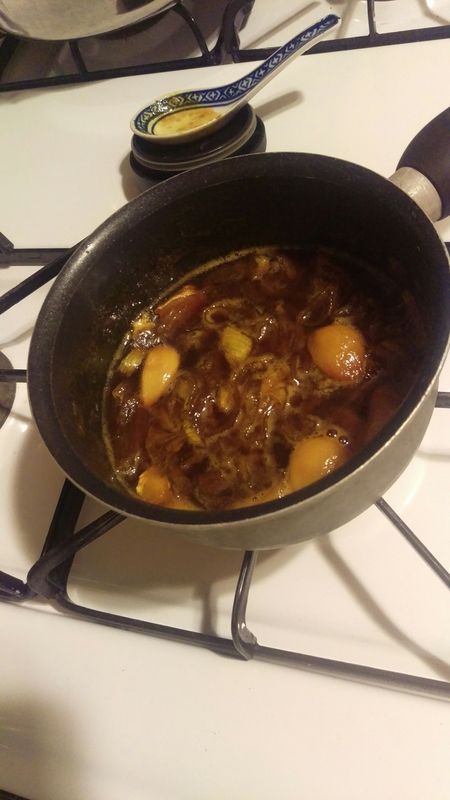 Option 2: This is the way that I make mine–In a small pot, add garlic, ginger, onion and cook until they’re soft and onion is almost translucent. Add in honey, lemon/ACV, turmeric, cinnamon stick/powder, and heat on very low (do not boil). Stir occasionally. After a few minutes, turn off the pot once the honey mixture thickens. Strain and keep in glass jar on counter for a week or two. For long-term storage, keep in fridge for at least a month. Stir before use. Take room temperature or warm. You can take it by the spoonful or add to tea (green, peppermint). Done! Super easy, and you have a homemade cough syrup in less than 20 minutes. I take this as often as I need to, sometimes every few hours. It sure beats the over-the-counter nasty cough suppressants that actually hinder your body’s way of processing sickness and pathogens. Ginger–Fresh ginger is a natural decongestant, anti-inflammatory, antivirial, and anti-histamine. It can also help with nausea and upset stomach. Ginger is also a warming food according to Traditional Chinese Medicine (TCM). This helps with warming your body and circulation, too. Onion–Has tremendous healing properties that work to draw toxins out of the body (which is why “onion socks” or onion poultices have been so popular). They are high in sulfuric compounds such as thiosulfinates, sulfoxides, and other odorous cysteine sulfoxides. These compounds give onions their pungent flavor and are what make you cry when cutting them, and the thiosulfinates have been proved to kill of salmonella and E. Coli. Furthermore, sulfuric compounds also play a role in cancer and heart disease prevention, and therefore act as a great immune-boosting food for general disease prevention. Garlic–Garlic is a powerful antioxidant with antimicrobial, antiviral and antibiotic properties. For colds and flus, it also provides decongestant and expectorant effects. It’s also been known to help with heart disease, cholesterol, blood pressure, and diabetes, in part because of Allicin, a key compound in garlic. Turmeric and Cinnamon–Both have effective anti-inflammatory properties especially when combined with other anti-inflammatory, anti-viral, anti-bacterial foods. They are warming to the body and help to suppress cough. Some people make homemade cough syrup only out of honey, turmeric, and cinnamon, but the others (ginger, garlic, onion) exponentially add healing properties.